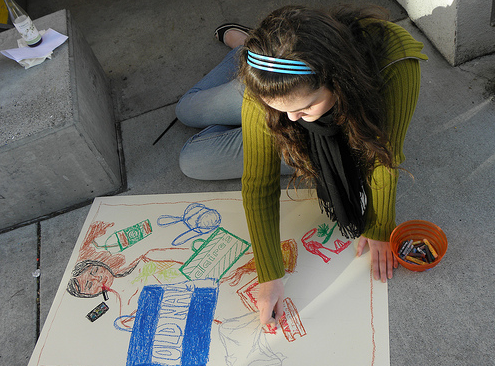 In the fall of 2010 Culture Collective collaborated with Buildon in San Francisco and Oakland to create a video for the Chalk for Change program initiated by Tom Silverman. Chalk for Change challenges youth to inform themselves about important political, social, or environmental issues in their community and take to the street with a message. Students depict issues that are important to them using chalk in public places to spark dialogue with people passing by. Tom invited Culture Collective Director, Jacob Devaney, to speak with the High School Students in this program about using social media and art to create positive change in their community. Afterwards, a video was created about the project for students to share through their Facebook and other social networks. We are happy to re-release the video on Facebook that it might encourage others to create something thought-provoking and beautiful in their community.